What a beautiful family this was! I love spending time with such incredible people as these as their Family Photographer in The Woodlands. They are some of the sweetest and kind folks I have had the pleasure of working with, and my time spent with them was nothing short of amazing! 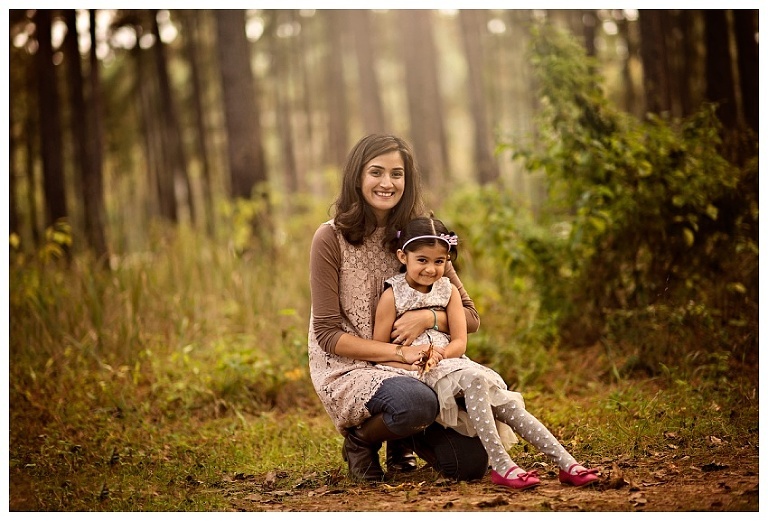 Family sessions are some of my favorites, because I love working with kiddos! Alina (5 years old) and Nael (little brother) were simply precious and full of energy! They seemed to have a blast during our session, which always makes for adorable photos. Mom and Dad, Nameer and Sana, contacted me to take photos of their sweet family, and we decided to go exploring outside to do so. We ended up in a field filled with trees and fallen leaves. The season of Autumn is so pretty, filled with orange and red colors everywhere. 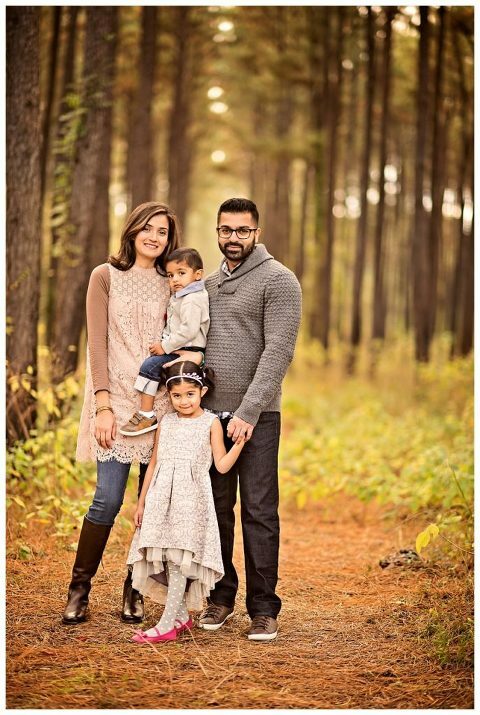 It truly makes for a beautiful background for a family session! 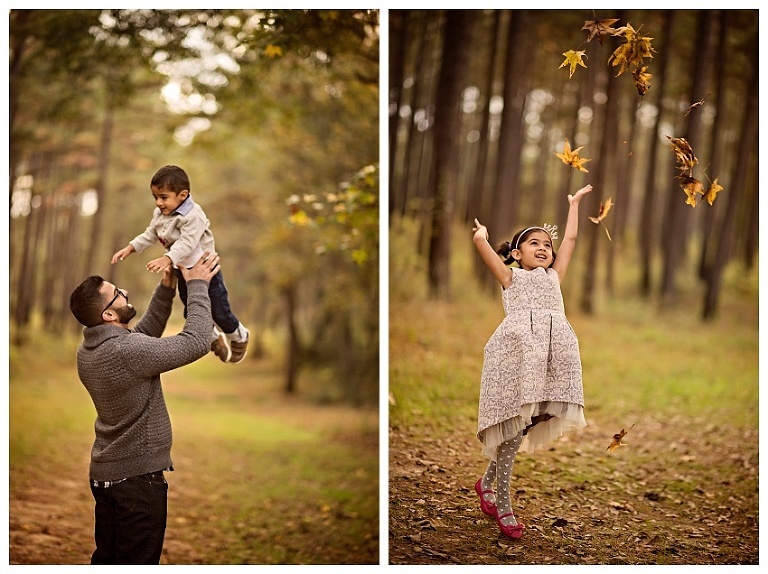 Alina and Nael had a blast while throwing leaves and watching them fall. One of my favorite photos was one where little Alina tossed them as high as she could throw them. Her expression was the cutest, and I love that we were able to capture a little bit of her personality! She is a very smart girl, knowing two languages, Urdu and English. She is full of curiosity, asking a ton of questions! It was so fun getting to know her. Her brother, Nael was also an active little one. He loved being outside, so he also enjoyed the day! He found a few pine-cones that sparked his curiosity, isn’t he so stinkin’ cute!? Nameer and Sana were beautiful together, and I loved seeing the joy and love in their eyes as they watched their kids play. They were precious as they stood with their little ones, all snuggled together. All in all, we had a beautiful Autumn day. I am so honored to have been able to capture such sweet moments for this family. I hope to work with them again in the future! Capturing these images for this precious family as their Family Photographer in The Woodlands was such an honor. What a gorgeous group! « North Houston Birthday Photographer | Happy Birthday Adeline!